Note: If at any time you would like to unsubscribe from receiving future emails, we include detailed instructions on how to do so at the bottom of each email. We offer the use of a secure server. All supplied sensitive/credit information is transmitted via Secure Socket Layer (SSL) technology and then encrypted into our Payment gateway provider's database. This information is only accessible by those authorized with special access rights to such systems and these users are required to keep the information confidential. After a transaction, your private information (credit cards, financial information, etc.) will not be kept on file for more than 60 days. Yes. Cookies are small files that a site or its service provider transfers to your computer's hard drive through your Web browser (if you allow). Cookies enable the site or service provider systems to recognize your browser and capture and remember certain information. Cookies, IP addresses, Referrer, Web beacons and other technology will be used to increase the speed of access by the users of this website, to increase the distribution of rental advertisement and to track website activity. Email addresses of both owners and renters may be collected and used for marketing purposes with an option to receive or not receive information related to rental property. Occasionally, at our discretion, we may include or offer third party products or services on our website. These third party sites have separate and independent privacy policies. We therefore claim no responsibility or liability for the content and activities of these linked sites. Nonetheless, we seek to protect the integrity of our site and welcome any feedback about these sites. What are some of the Fraud Prevention Measures used on this website? The website program filters out emails containing known fraud phases using a key word finding routine. We have a dedicated employee to monitor the website for possible scams and fraudulent activity. Easy function to "Report" these ads so that the ad can be removed from our website. "7 Warning Signs of Possible Fraud" are available to owners posting rentals. Quick link to report fraud to the FBI's Internet Fraud Complaint Center: www.ic3.gov. Email addresses of owners posting properties are not disclosed to prospective tenants. Click to proceed. "I will exercise caution" is displayed at website launch with the warning, "never send money or give personal information to anyone without first considering the possibility of fraud." Each user selects their own unique user password which is the key to accessing their account. Online support by clicking "Contact" on the home page. "If you have questions about using our system, or specifically about your account or posting, please start with our Frequently Asked Questions (FAQ)." What information is not disclosed to users of this site? Credit Card: Information is collected for payment from credit cards using Secure Socket Layer (SSL) technology that encrypts the card information so that it cannot be read over the Internet. What information is disclosed to other rental sites? Rental postings may be distributed to other rental websites. We are not responsible for the privacy practices or the content of other websites. We currently distribute rental information to the following websites: (Please refer to their websites and privacy policies). No refund will be given for advertisements that you place using your credit card. Full refund will be given for advertisements that a fraudulent person placed using your credit card. This website has no products that are shipped. All services, including text, graphics, logos, etc. 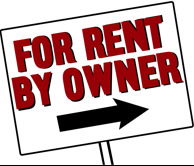 are Copyright 2019 For Rent By Owner, Inc. For Rent By Owner logo is federally trademarked. "ForRentByOwner.com" is a subsidiary of FRBO, Inc, a Colorado corporation.